Cloud computing refers to computers and applications that run remotely and are accessed over the Internet. In cloud computing, virtual machines run in large data centers and replace physical PCs and servers. By aggregating the computing needs of many users within a single center, economies of scale are achieved that result in significant benefits such as lower power utilization, simpler setup and maintenance, and easier upgrades to capacity and performance. Many applications can run unchanged as you redeploy them from local desktops or servers to the cloud. Watch this video about the Microsoft cloud offerings, and then prepare your environment by installing the tools you'll use to build your first Azure application. Now that you know what the cloud platform is, watch this next video to learn about the tools and technologies for cloud development, including three key building blocks for cloud development based on the Azure platform: Windows Azure, SQL Azure, and Windows Azure platform. Use the tutorial to learn the steps involved to install the components required for creating and publishing Windows Azure applications. For help picking the right version of Visual Studio, review the Visual Studio 2010 comparison chart. For more information about team development, read about Application Lifecycle Management. Watch the video or complete the tutorial, and get started coding right away. This tutorial will guide you through creating and deploying a Hello World sample by using ASP.NET MVC 3 and Windows Azure. 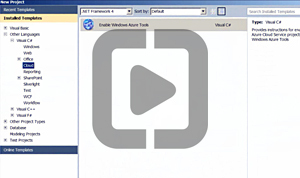 In this tutorial you will learn how to create an ASP.NET MVC3 application, build and run it locally, deploy it to Windows Azure, and stop and delete that deployment. After you follow this tutorial, you're ready to move on. Windows Azure provides the core computing and storage capabilities for cloud-based applications. This tutorial teaches you how to deploy a simple prepackaged application in Windows Azure, including moving the service created from a staging to a production environment, and scaling the service. It requires no coding or programming skills. In this video, you are shown the steps involved to create and provision a simple SQL Azure database. Helpful and instructive tutorials on getting started with Windows Azure. Learn about Office 365, including a training kit. Get training and courses on Dynamics CRM. Harness the power of the cloud in your own datacenter using Hyper-V and System Center. The Windows Server 2008 R2 hypervisor-based server virtualization technology. Cost-effective and agile datacenter services to manage your physical, virtual, and cloud environments in an integrated manner. Write application code in .NET or other languages such as C/C++, PHP, or Ruby. Learn security, privacy, regulatory compliance, and backup and recovery with Windows Azure. Twenty articles covering everything from getting started to implementing best practices for elastic cloud applications. Learn to use Windows Azure, Windows Azure AppFabric, and SQL Azure together and separately. Explores designing and scaling front-end and back-end services that run in the cloud. Demonstrates how you can adapt an existing, on-premises ASP.NET application to one that operates in the cloud.